Danger! Action! Trouble! Adventure! 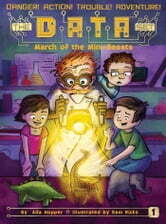 Introducing The DATA Set, a brand-new chapter book series for young readers. What would happen if your next-door neighbor were a mad scientist? Gabe, Laura, and Cesar live on a quiet cul-de-sac. They are the whiz kids of Newtonburg Elementary and each specializes in their own subject. In fact, everyone in town lovingly refers to them as the Data Set. However, their quiet days of learning take a sudden turn for the exciting when they meet Dr. Gustav Bunsen—a mad scientist who throws the kids into a wild spiral of adventures. When Dr. Bunsen’s latest invention, a growth ray, hits several tiny animal toys, the mini beasts don’t just grow, they come to life! The DATA Set love their new tiny pets…until they continue to grow. Now there’s an actual elephant in the room—not to mention a chimp, a giraffe, and a dinosaur. When the beasts wander off, it’s up to the DATA Set to track them down. But will they catch the mini beasts before they grow big enough to start trouble in town? With easy-to-read language and illustrations on almost every page, The DATA Set chapter books are perfect for beginning readers! HALLOWEEN CRAFT TIPS – Create Halloween Crafts Like A Pro!